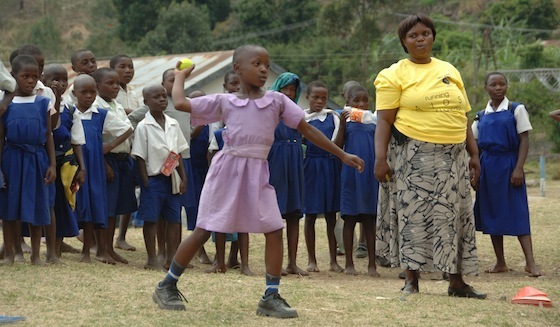 If there is one over-riding impression of Uganda – it is the commitment of school children to their education. 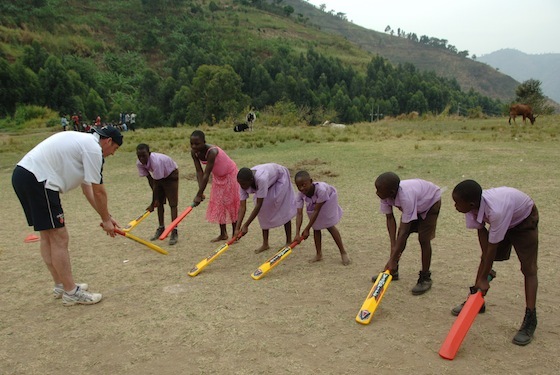 They literally walk miles to and from school – and during the Cricket Without Boundaries project we have witnessed their thirst for learning. 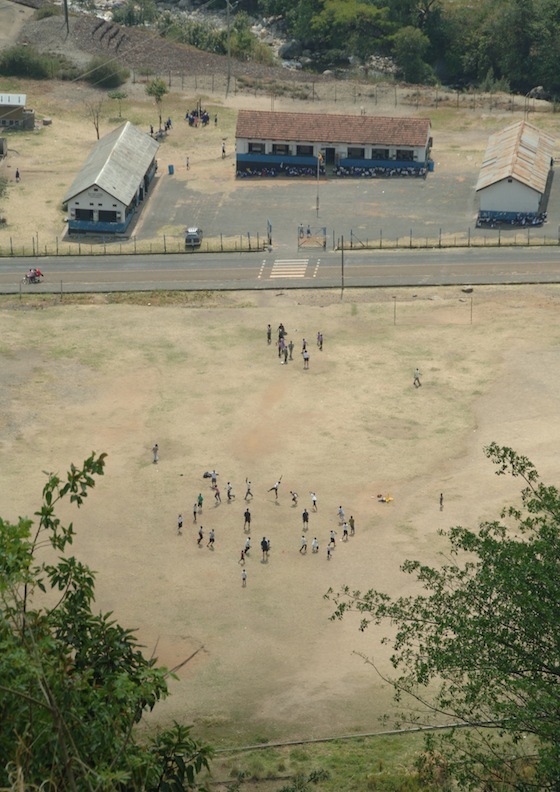 Before one of our afternoon sessions at Kilembe, I took the opportunity to walk up one of the mountains above the playing field. My first stop was about 100 feet above the field – which gave an excellent view. I sat for a while waiting for the next batch of children to arrive – and met a young lad called Baluku Bright (who had attended the impromptu Sunday training). He had spotted me from down on the field – and had run up to find me. He wanted to show me his home, which he said was “just above where I was sitting”. His idea of “just above” and mine differ slightly. I registered the climb on my iPhone’s altimeter – and we climbed a further 500 feet. He went up like a mountain goat – and I was rather out of breathe (he carried my bag for the last 200 feet!). 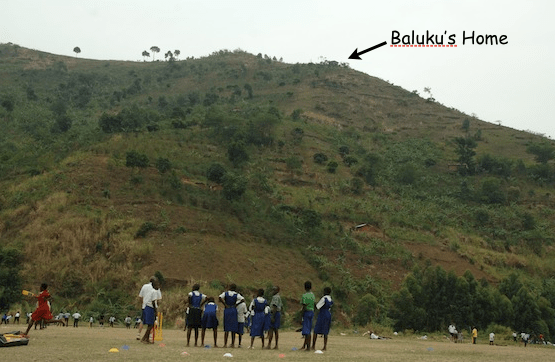 Please watch the video of Baluku showing me the spectacular views from his family’s home. You can see where his home is in relation to our cricket training on the picture below. It was an experience…. …. and just to prove the height – this is the view of the ground as I was halfway down the mountain! We also had a small primary school group from Pride Academy Kisinga. They had travelled 35 kilometres from their school – and hired a vehicle to fit 10 people – 4 teachers and 6 pupils. The distance and transport difficulties meant that they each had to find accommodation in local homes of teachers and family, so that they could attend the second day of coaching. 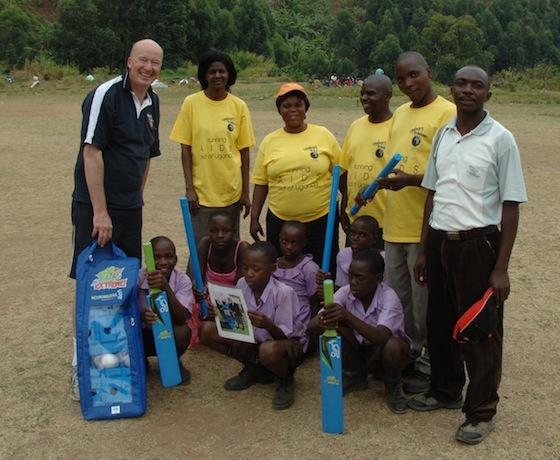 I was really pleased to be able to present to them for their efforts the cricket kit donated by the girls of Lincoln House at Oakham School. This was complemented by balls and t-shirts from Cricket Without Boundaries. 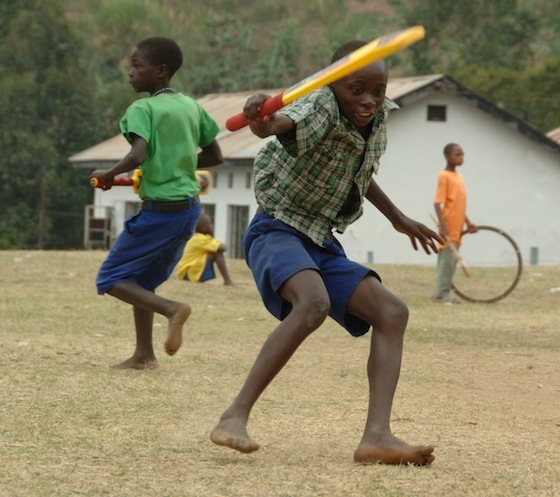 The school were delighted – and are ready to take the game of cricket to all the other pupils and teachers. Highlight of the day was our journey back from Kilembe to Kasese. We couldn’t let the children from the Pride Academy walk all the way back to Kisinga – so we packed them in to our bus! The thanked us by singing a beautiful song “I am a teacher/driver/cricketer because of education”. Listen to the lovely voices in the video below…. What a lovely cause ; ‘cricket without boundaries’ is doing. The kids looks so happy they have everything to have a health life better than the one’s on other nations. I am surprise how good they speak English!. Kudos to all the team! I really like your drive and the projects you are involved. I hope Mexico would do something like the ‘cricket without boundaries’. I have special interest with all the children left without parents because of the war crime. It will be great for them to learn a new sport before they are hired to become extensions of the drug Cartels. Keep up the good work! It looks like you are having an amazing time out there. We have just come back from Tanzania, working with children in the 10 schools in the Leicestershire/Rufiji partnership. I found it very enlightening and rewarding and since coming back, the children back in school have been inspired by what I have shared with them. I am sure that you will be getting as much out of your visit as I have out of mine. Hi! I’d like to start an initiative to build schools in small villages that need them. 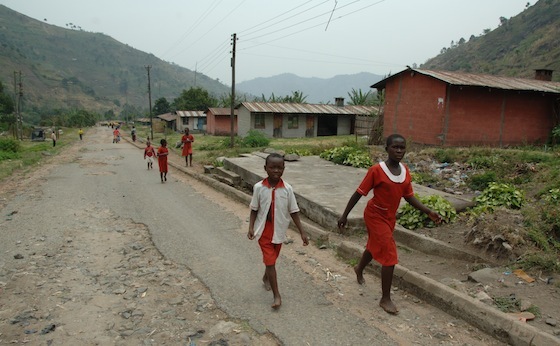 In your article you mentioned that some children have to walk many kilometres to school. While in Uganda, did you come across any villages that are in need of a school? One more time; this is amassing what you are doing with the Cricket project. I must congratulation one more time, amassing!. I wish we can do a project like this in Veracruz, Mexico. I’m incredibly honored to have the pleasure of seeing your work with the Ugandan boys and girls! Projects and work such as yours always make my day and thank you! Keep up the good work and thank you for agreeing to help my organization Lend a Hand Uganda spread the word about our first charity event.